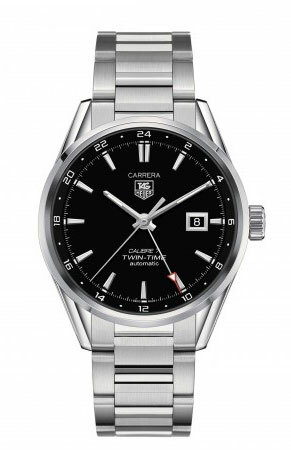 Buy this new Tag Heuer Carrera Twin Time 41mm war2010.ba0723 mens watch for the discount price of £2,040.00. UK Retailer. Stainless steel finely brushed bracelet with polished edge. Black outer flange with white painted Arabic numerals, displays second time zone. Date window at 3 o'clock framed in hand-applied, beveled stainless steel . Tag Heuer Caliber 7, beats at 28,800 vph & has an approximate power reserve of 42 hours.